Reuters’ Jorge Duenes’ cropped aerial shot of a 300-acre marijuana plantation “discovered” in Mexico last July that The Atlantic’s InFocus photoblog ran today was dramatic and awesome enough to make me want to see the full thing. 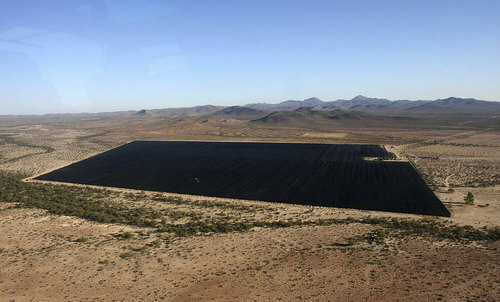 An aerial view shows parts of the biggest marijuana plantation ever found in Mexico, in San Quintin, about 350 km (220 mi) away from Tijuana, on July 13, 2011. Mexican soldiers discovered the plantation in a remote desert, a top army officer said on Thursday. Soldiers patrolling the area found 300 acres (120 hectares) of pot plants being tended by dozens of men. 350km from Tijuana does sound remote. But San Quintin turns out to be on the northern part of the Baja Peninsula, the part where the highway runs between the mountains and the sea. On Google Maps, it’s clear the landscape is characterized by agriculture–and airstrips. To still be in San Quintin, the terrain in Duenes’ photos almost certainly has to be just off the main highway, and one of the largest crops of any kind in town. Saying it was discovered, then, implies that its existence was not known beforehand, which, holding other factors constant, seems impossible. Still, the important thing is, it does look awesome. Previous Previous post: Is Shanzhai Still A Thing?